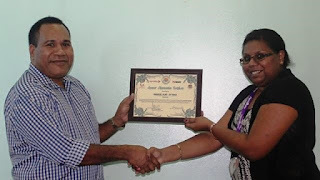 Digicel PNG was the Gold Sponsor of last year’s workshop hosted by the Office of Censorship on ‘Censorship Awareness and Media Partnership’ in November 12 – 13, 2015 at the March Girls Resort, Gaire. The package included an advertising spot which ran on air on TV Wan for a week following the event and also an ongoing transmission of the spot as a filler including K7,500.00 cash totaling K20,000.00 which was the Gold Sponsor amount. Chief Censor Mr Steven Mala was pleased with the outcome of the Workshop and thanked Digicel Play for their support in ensuring a successful event was carried out. Deputy Chief Censor Mr Jim Abani took the privilege of presenting the Certificate of Appreciation to Compliance & Contract Manager Ms Margaret Kunai from Digicel Media Ventures Limited for their contribution at the Office of Censorship on 8th March, 2016. Ms Kunai thanked Mr Abani on behalf of Digicel PNG and was pleased to receive the certificate on behalf of the Chief Executive Officer.